Just yesterday I was visiting over on Twitter and I saw a tweet about cycling helping with migraines. That sounded very interesting to me. I, thankfully, don’t get migraines, but I feel as if I know a bunch of people who do. And a migraine is not just a headache, so I have great sympathy for migraine sufferers. I rarely get headaches and when I do, I do not like it. It is so uncomfortable. When I get a headache, since I rarely get them, I know there is a REASON. I don’t just GET headaches, there has to be SOMETHING that is making me have a headache. Most of the time I can figure it out and fix it. Sometimes I can figure it out but I can’t fix it, but at least I know why I have a headache. Headaches are awful. I know that migraines are WAY worse than headaches. Some have very severe pain, more than just “headache pain” and some migraine sufferers have additional symptoms like dizziness, blindness, vomiting, and more. So, as I said, I thought that “cycling for migraines” sounded interested. It was a video report. First of all, I would call it “spinning” not cycling. But . . that is perhaps just me. I think of cycling as riding a bicycle and riding it outside. The video was about what many people call “spinning” as in riding a stationary bike in a spin class and the video does actually call it “indoor cycling”. I think that riding a bicycle outside is way different from riding a stationary bike in a class. One reason that spinning might be a good form of exercise for migraine sufferers is that the head can remain pretty much stationary. On a bike ride outside the could possibly be bouncing involved and jolting of the head might aggravate a migraine. So it makes sense that stationary would be better and could be good. It could be just be called “spinning” at the gyms and venues that I am familiar with. So basically the video said that 36 million Americans suffer from migraines. Now I am guessing that the number stated are reported migraine sufferers. I bet there are a lot more people who don’t even go to the doctor or report to anyone that they suffer from migraines. So I imagine that is a low number. It also said that low impact exercise is good for migraine sufferers, because their head doesn’t move and there is not jolting. The video also said that there was a Swedish study in 2008 where most of the participates showed improvement after being in a 3 month cycling program. 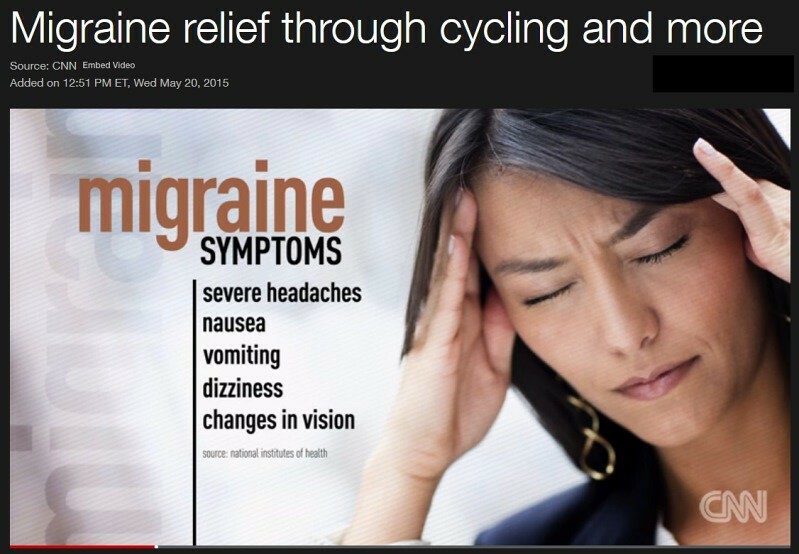 It ended the spinning segment by saying no one is saying that cycling (spinning) is a cure, but they are suggesting it can help people who suffer from migraines cope with the pain. Often time exercise helps people cope with pain and other things that are affecting them. It is a matter of finding the RIGHT exercise. Something that does not exacerbate the issues they are having. But movement helps so many areas of our being. I am always one to suggest Nia as an aide, but in the case of migraines I can understand how one might not want to move their head. I have never actually tried spinning. But I know in Nia we move the head a lot. Do you suffer from migraines? Have you ever taken a spinning class? You are probably familiar with the stability ball. If you have ever gone to a gym or a place like it you have probably seen them. They are a great tool to use. They have even found their way into offices. Some people use them to sit on instead of office chairs. A small group of women I worked with when I was still in the corporate world tried using them as chairs. They work fine to sit on. They can give you an extra reminder to engage your core and not slouch, but they were very inconvenient when it came to moving and rolling. I mean there is a reason office chairs have wheels. I never even realized how often I rolled around at my desk until I had the ball. It was most inconvenient and took up extra time. They have bases that the ball can set into. I do not know if they have wheels. I am also not clear on that whole concept. I thought the idea of sitting on the ball was to balance yourself on the ball, therefore using a lot of extra muscles. So with the ball in a base that holds it balanced, it is not clear to me what the benefit is. Well, that is where we can turn it around and I can show you a nice benefit to the stability ball. A nice open-the-front-of-the-body stretch. I have already showed you the Stability Ball Pass (click here for that) and the Hamstring Curls (click here for that) in two separate posts. Those are two great exercises you can do with the stability ball. This post is about a stretch. Easy, plain, simple. It is like the stretch on the roller but much bigger, more intense. You start by sitting on the ball, then walk your feet out away from the ball. 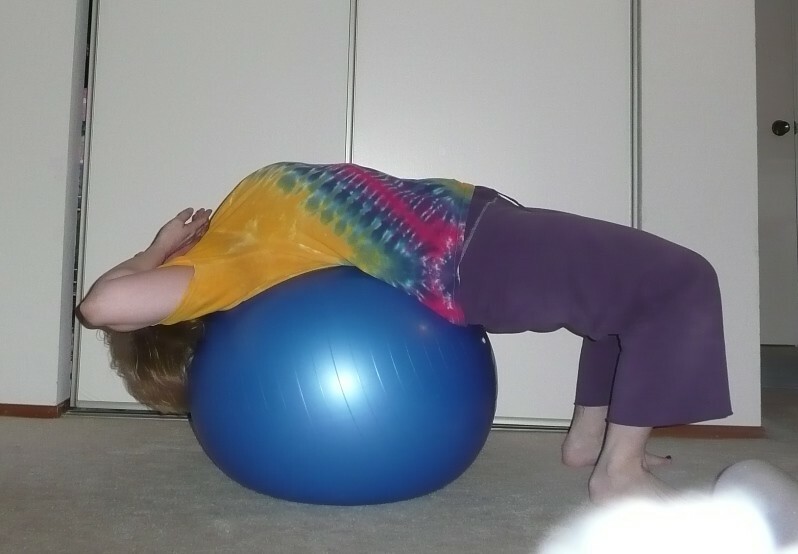 Allow yourself to roll on the ball from tailbone to full spine. Stop at the point where your back is fully supported by the ball. Your neck is about at the start of the curve where the crown of your head is hanging over the “edge” of the ball. You can start small with your arms by keeping your elbows bent. (As shown in the first picture.) Your hands near your face. If this is a big stretch for you, just let your arms hang in the bent elbow position. If you are looking for a much bigger stretch allow your hands to go over your head and let your arms hang. You can adjust and experiment with your arms more “directly” over your head or with your arms wide and your hands over your head, but out to the side. Both positions a great stretch for the upper arm muscles, but the target muscles are slightly different. You will be able to sense it and decide which is best for you at the moment. This is good for opening up and stretching the front of your body, your chest and abs. Your back gets a little stretch in the form of a small back bend, but it is the front upper half of the body that you can really sense it. I love this stretch! How about you? Are you familiar with this one? Do you love it? I imagine I am like all dance exercise teachers, in that when I hear music I enjoy I think about how I can bring it to my Nia class. I think about creating choreography to it. I was thinking the other day about what music would appeal to one of my classes. My train of thought took me on a little journey. First off – before I share my journey – this is not a rant about how modern technology has caused huge chasms between people because while there are some disconnects there are some great connections. This IS a little about how things have changed and how we miss out on somethings but it is more of a ride down a memory rail line then a rant. Many of you that lived through the time period that I am about to mention, have probably heard the “remember when” about when you had to listen to the radio “all” day before you could hear that song (ya know, whichever one you wanted to hear) again. There was no device to turn to that could play it instantly. Unless you held your cassette recorder up to the radio and recorded it, you had to wait for it to be played on the radio. There was also the accidental sharing of music that today’s technology prevents happening. When I wanted to listen to my music I had to go into the living room and play my records. I usually had to ask if I could. Then I would turn on the stereo with the turntable for the whole house to hear. I am not saying that I played it loud, I am just saying that it was played through speakers so everyone had to suffer through me playing my latest obsession over and over and over. That is why I had to ask permission to play my music. If I was playing it, the people present would have to listen to it. So I am sure my mom got to “know” my music. I shared with her that “latest” tune. The pop music. Now-a-days people have personal devices with which to listen to their music, so it could be that parents never actually hear what their kids are listening to. They don’t get to connect on that level. Not that parents and kids ever connect on the same level when it comes to music, but sometimes it could happen. I imagine my parents became very familiar with some of my music. I bet they even learned some of the lyrics via pure repetition. I bet that they even grew to like some of it. With these thoughts rolling through my mind, like a leisure train, it made me think that this might be the case with some of my students. I would love to bring music to my Nia classes that reminded them of connections with their children. The connections could even be so tenuous as them not even really liking the song but the sense of familiarity and family would allow their bodies to connect to it. They could move and enjoy the sensation of movement without really thinking about it. They would be able to associate memories to the music. Ha. These are the thoughts of a Nia Teacher wanting to MOVE her students. But, as I first mentioned, I bet other cardio dance workout teachers think the same way. What do you think? Do you think songs like that could get you moving? Do you think songs with that type of connection could allow you to dance? Nia is a practice. Yoga is a practice. Playing a musical instrument takes practice. One does not just step into a Nia class and do it exactly right the first time. One does not move into a yoga pose and get it exactly right the first time. One does not start to play a song and do it exactly right the first time. It all takes practice. With Nia the emphasis is on the body’s way. I have said it before, but I will say it again, there is a right way to do the moves, the body’s way, the way the body was designed to move. But every body is different. Some bodies do not move the way they were designed. Some bodies never will, but some just need time. Yoga is a little different in that the positions are a bit more exact, but still, if your body does not move or bend that way do not force it. It could be that your body needs to work toward that pose, it needs to practice or it could be that the actual structure of your body will not allow for the exact post to be attained. Either way it is a practice. Nia is more forgiving. Since it is a dance there is a lot of room for freedom. With yoga people expect there to be one way to do the pose but again, not exactly true. The individual’s body needs to be taken into account. Some bodies will just not bend or fold certain ways. They might be able to bend more or fold more than the first time a yoga asana is attempted, but it might never look exactly like that magazine picture. Most pictures of people in yoga positions are just like that of high fashion and/or make up models. They are the exception not the norm. They are showing an example of what the pose in its absolute perfection is supposed to look like. They should be required to disclose how many years that person has been doing yoga or how long they were actually in that pose. JUST like people are telling young girls to give up the idea of looking like the women in magazines, some people need to go a little easier on themselves when it comes to yoga poses. The idea is not “to look like the picture” but to be better and more comfortable at doing the pose as time goes on. In the picture the person might have their elbows on the ground and when you start you can barely touch the floor. Well, the proper way to learn (at least one way . . . another is props, but for this example we are using progression) is to practice until you can touch the floor. Practice with good form. Then practice until you can stay touching the floor – with good form. Then practice until you can stay longer each time at touching the floor – with good form. Don’t injure yourself trying to put your elbows on the ground and all the while not achieve good form. I do not believe that practice makes perfect. Practice just makes time get used up. But good practice, practice with good form, practice that allows you to get better than you were is good. “Perform (an activity) or exercise (a skill) repeatedly or regularly in order to improve or maintain one’s proficiency.” Yeah that. Being patient with oneself and allowing one to practice and make it good practice will get one further on a the path of proficiency than just trying to get to that pose without working into it. While we all know this, I was reminded that many of us need to be reminded of this. Nia is a practice. Yoga is a practice. Playing a musical instrument takes practice. How are you are practicing? Do you like the process of learning or do you like to just jump right in and do it right and all the way the first time? Wow. I just noticed that there are only three days (if you include today) left of the multiple planks. Three planks a day every day for 30 days. I missed three days. Well, I have three days left to make sure I get all three in. This morning I took a yoga class at the studio where I teach Nia twice a week. This week is Bay Area Dance Week and so the class I took was free. It was nice to get my mat out and do some poses. I don’t use my mat at home, I just do it on the carpet. There are a lot of free classes this week so you might want to check it out. You can see a schedule of free classes in my post, Free Nia, Zumba, Belly Dance, Yoga, and More. So I am going to go do my three planks. Have you done yours yet? Well, I have to say that this past week a couple of days I remembered about the planks at about 3 minutes past midnight. I decided to count those days as I promptly got down on the floor and did my planks. But I also have to say that Friday and Saturday I remembered too far past midnight! Friday it was about 12:30 and Saturday at 12:10 I remembered, but I decided to let it go. So that is three days this month I didn’t do them at all and a few days that I did them after midnight. My mind has been a little preoccupied lately, but that really is not excuse as we all have things that are on our minds. What I do is I think about them and say, “Oh, I’ll do it later.” Then next thing I know it is after midnight.” So while I was typing this I had to stop to do them so I would be sure to have them done. I got all three in! As I said in my last check in, it really helps me to have that every day check in. Checking in once a week is not a good enough reminder. Here’s to a more “on track” week! 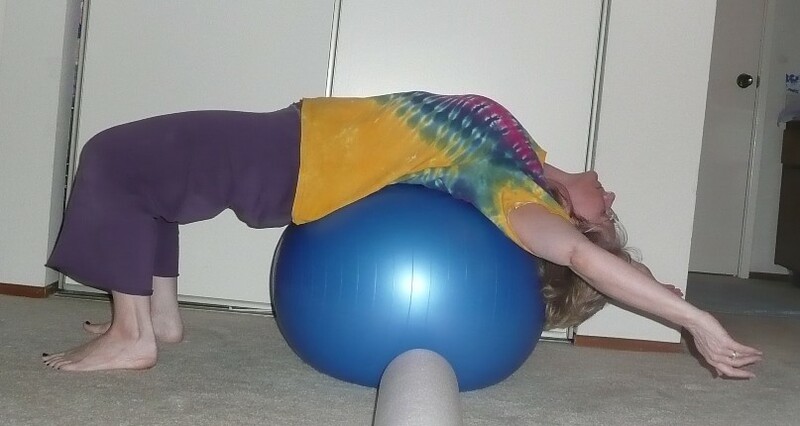 I started this challenge as a way to help us keep planking and I was thinking my friend who always participates in my challenges would have a better time of it if she didn’t have to check in every day. I was thinking that the three minutes it would take to plank — either all at once or throughout the day — would be easy. She was on vacation and I was thinking she would have a lot of time to get some planks in. Not so. Vacations are so busy. It seems as if LESS gets done because there is no schedule. So she might be joining us after she gets settled. I will continue to be challenged to do it three times a day. So far today, I have done two. Now I have to remember to do the other two! Well, it is called a challenge for a reason, right? Yesterday I remember on the way out to the 52 Nia Moves Class so I did one. And while we did a long plank in the class it was a straight-armed plank so I am not counting that. I remembered I had two more to do, but when I remembered I had a cat on me. In my house that is a special thing so we don’t move! Then once she moved I had forgotten and I didn’t remember until I was going to bed after midnight. I will do better with the rest of the month. This week I am going to try an actual schedule and see if I can remember to get them all in. And next week I will post the check-in in a more timely manner! 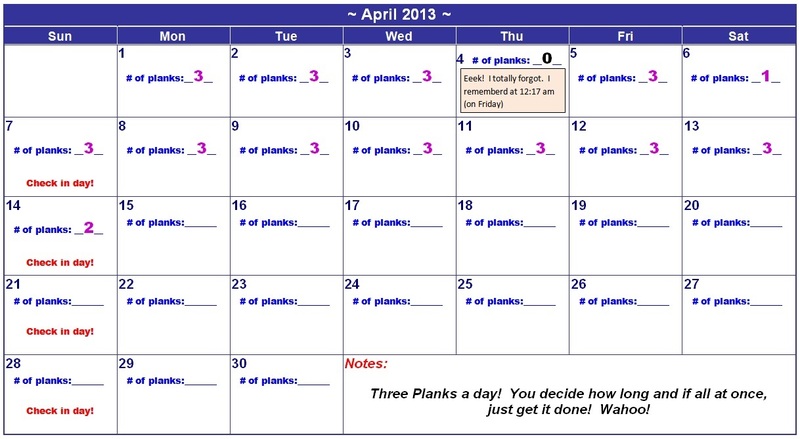 So, how many days did you manage to get three planks in? Ha. Ok, so I was thinking that I had a check in. I think, “I will do one and post on my plank check in that I have one down and two more planks to go.” I was looking to encourage and get encouragement. Then I come to my blog and remember that I am doing a weekly check in. So, ok, I won’t do this everyday. I promise, but heck, since I got one down and two to go, I am gonna tell you about it. Especially since it was such a good one. If felt good! It is really late, though so I need to go to bed. But I want to cheer you on. You can do it. Just do it. 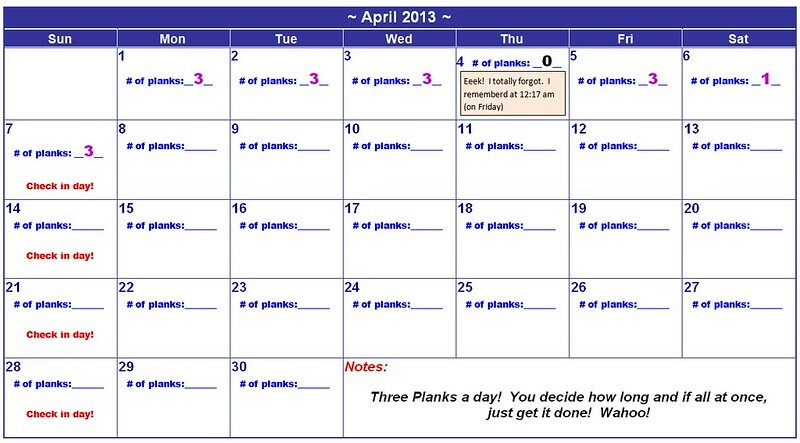 Get on the floor and do three planks a day with me for the month of April! Yes? So today is our last day of our Plank A Day For A Month Challenge. What do you say? Are you ready for more?